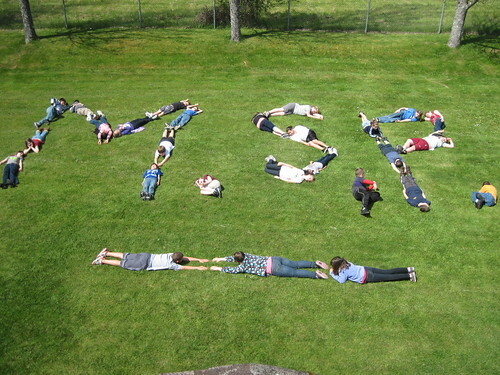 MSP 2011, a photo by Southworth Sailor on Flickr. Another year of MSP testing was completed today. This year was marked by the great pencil fiasco. On the first day of testing, all students in the school were given special pencils for the tests. Somewhere in the ordering process #2 1/2 pencils were shipped to the school and no one caught it until the students had started testing. Some of my students commented, but I figured that the testing coordinator would not have given them out if they weren't kosher. Anyway, once the mistake was discovered, it was school wide panic. Calls were made to the state testing office and we were told to have the students erase their answers and remark them with #2 pencils. District personnel scurried to the building, combing over each test to make sure the correct pencil lead was used on every question. We hope that the incident does not invalidate the tests. Most likely not, but it made the first day exciting to say the least. I have high hopes for our fifth graders who took math, reading and science tests. My collaborative 5th grade teaching buddies put meal wagers on whose class will have a higher percent of passage. It's a bit of a can't lose because winner buys the meal; but I hope I'm buying!